Roofing has changed a lot since the wooden shake shingles of the old days. Today’s homeowners looking to complement their cottage or rustic-style homes should look at the plethora of modern shake-style roofing options available to them. Shake shingles traditionally have been made of wood. But today’s shake-style roofing shingles are asphalt and fiberglass-constructed shingles designed to deliver the charm and character of hand-split wood shakes but at a fraction of the cost and maintenance. Modern shake-style roofing is the ultimate in style and protection. It replicates the look of wood shakes, while offering the high fire and wind resistance of asphalt shingles. They’re thicker than regular asphalt shingles and are more resistant to wind, snow and ice, which is why they’re growing in popularity. In fact, most new and replacement roofs that you see today are constructed with shake-style roofing shingles. Wooden shakes are prized for their durability and aesthetic aging appeal—they transform from a bright, warm red and brown tones to a distinguished gray color over time. They’re also energy efficient, can be recycled into mulch and chips, and are durable. The downsides with wooden roof shakes is that they are high maintenance. They tend to show wear-and-tear easily—exposure to the sun and rain, poor ventilation, mold, mildew, rot, and even fungus growth can all take a serious toll on wooden shakes. Without proper and regular maintenance, they split, they curl and they can undermine the overall integrity of the entire roof system. One other drawback: as one would expect from a material that is so labor intensive—wooden shakes are very expensive. They can cost three or six times the cost of an asphalt roof! So, is there an affordable alternative that combines style and protection? 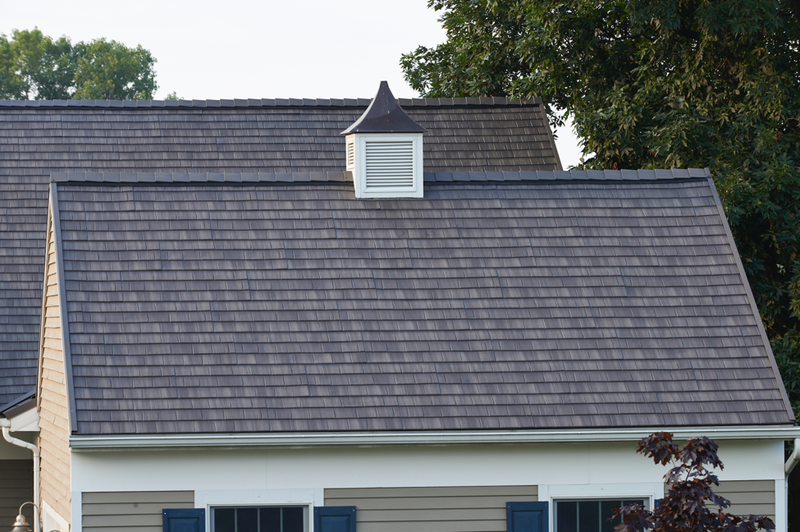 Homeowners wishing to extend the life of the roofing system or provide lower energy costs, should definitely consider today’s modern alternative: shake-style roofing shingles. Unlike wood, shake-style roofing shingles are virtually maintenance free. They won’t rot or decay like their natural wooden shake counterparts. Made of a woven fiberglass base mat, covered with a waterproof asphalt coating and topped with ceramic granules that shield the product from harmful UV ray, shake-style roofing shingles are energy-efficient, Class A fire resistant, and have longevity. Lightweight and fade resistant, shake-style roofing can last longer, is backed by a long-term warranty, and comes with Energy Star certification. Some premium lines of shake-style roofing tiles are even algae-resistant for up to 10 years. For homeowners concerned about losing that Old World charm and attractiveness of traditional wooden shake roofs – there’s no need to worry. Today’s shake-style roofing shingles feature intricate, detailed design work for a truly sculpted, multi-dimensional appearance that is nearly indistinguishable from wooden shakes. Some are so realistic that they have been approved for use in historic preservation. Shake-style roofing shingles are available in a diversity of colors that complement any trim, stucco or siding and are designed to replicate the shade, texture and rustic design of cedar roof shakes. The variety of colors and designs of shake-style roofing options allow shingles to be blended and layered to create a custom roof in a distinctive style, giving your house a lot more depth and upping the overall curb appeal. Will Your Shake Roof Make it Through the Winter? A well-constructed roof made of quality roofing materials is guaranteed by warranty to withstand 50 years of cold and snow, heat and sun, wind and rain — that is, when you get a roof replacement from Long Roofing. If it’s time to replace your shake roof before the winter season sets in, contact Long Roofing at 844-602-LONG or visit us online to request an estimate. The Long family has served the home improvement needs of families for over 70 years.